Why do we almost always say yes, when we really want to say no? What is it that makes it so hard for some of us to say no? I think we have a built in instinct to say yes. It is probably an ancient human trait to look out for our family and our tribe. In ancient times the tribe was all important. It took a group to survive and prosper, so teamwork was essential. You would have a problem or possibly be ostracized if you said no or refused to help someone in your village. It would be unthinkable. But today is a different world. Most of us are already overwhelmed and operating at a slightly chaotic level. We have enough to do without taking on some else’s problems. In many conversations, especially with family, there are so many unspoken issues and feelings swirling around that any request for a favor is never straight forward, it always gets colored with feelings of obligation or guilt. And some of us are pleasers and it is very hard to say no when you are a pleaser. Some of us thrive on a higher level of chaos. 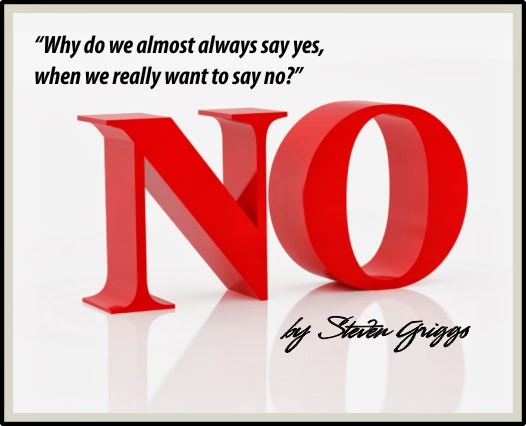 Saying yes to other’s requests provides oodles of opportunity to be overwhelmed. It feeds right in to our martyr complex. I have been guilty of being a pleaser for a large chunk of my life. I was always thinking of the other person, always putting someone else’s needs before mine. I never thought of putting myself first. I was the poster boy for the Pleaser Hall of Fame. But you can’t allow yourself to be pulled in to serving other people’s needs. First of all, if someone is asking you for something or asking for a favor, why? Why is it really necessary to ask anyone to do something for you? I can’t think of the last time I asked anyone to do anything for me. Maybe I have and just don’t remember it right now but I really can’t think of any time. But again, why is someone asking you to do something for them? What is really going on? Is it an emergency? Is there a dangerous situation that they need help with? If so, OK.
Is it helping with a family situation or maybe babysitting a family member’s kids for a few hours? That’s OK.
What I am really talking about is the kind of person who is probably a little oblivious and self-centered and has no problem asking for favors. They are the opposite of being a pleaser, they are probably a taker. But then again maybe they are overwhelmed and stressed out because they have too much to do. They probably have a hard time saying no too. Most of us have full plates with our careers, our families, and all the complexities of today's connected lifestyle. It can be too much. We humans aren't born with the bandwidth to handle all of this stuff. But the real truth is that when you say “No” you are really saying “Yes”. You are saying “Yes” to yourself, Yes to protecting and nurturing yourself. Yes to living a simpler, quieter and less stressed life. You are also affirming that you are in alignment with who you are. Yes, you can help others, and yes, you can do favors for other people but only if it is truly something you feel OK with and don’t resent doing. If you feel for an instant any type of resistance within yourself, stop, withdraw the offer and don’t do the favor. If you say yes and don't mean it you are just setting yourself up for problems by creating resentment and anger. This will be smoldering and stewing within you and will affect your health, not to mention your relationships. That is not good. Just say, “I’d really like to help but I can’t right now”. Or “ No thanks today’s not a good day for me” and move on. Don’t explain or give a reason about why you’re saying no. If they persist and try to talk you into it then you’ll know for sure you made the right choice. So don’t argue or explain or offer to do it later. Create a huge pregnant pause and wait. Let them fumble around and try to regroup. I’m not saying to be mean or hurtful, just be firm and loving when you say “no thanks”. It will be difficult at first and you may feel guilty but watch the other person’s reaction. If they react negatively you just got a good insight into their real agenda. And you probably aren't at the top of their list. But if they are understanding and considerate then maybe you’ll offer to do them a favor at a later time when it’s more convenient for you. But either way remember: say “No” with love but start saying it today. Don't worry, you can always say no tomorrow. It isn't possible to say yes for yesterday.